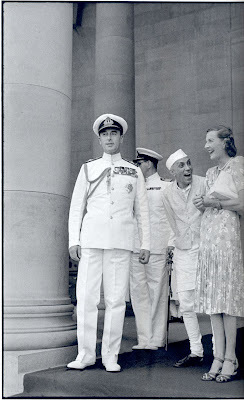 Another Magnum blast from the past, Cartier-Bresson's one insightful image from India, of the outrageous Mr Nehru propositioning Lady Mountbatten in the presence of the good lord himself. Henri Cartier-Bresson had a sixth sense. He always knew where to be at "The" moment. Ah, but Mr Eager, wouldn't you say that Mr Nehru always knew where to be at "The" moment. Perhaps, but was not Mr. Nehru the "moment"? Am I Mad, in a Coma or Back in Time?